WILLIAM HOWARD TAFT was born in Cincinnati, Ohio, on 15 September 1857; graduated from Woodward High School, 1874, Yale University, 1878, and Cincinnati Law School, 1880; was admitted to the bar and served as court reporter for the Cincinnati Commercial; was assistant prosecuting attorney of Hamilton County, 1881�1883; was assistant solicitor of Hamilton County, 1885�1887; married Helen Herron, 1886; was judge of the superior court, Cincinnati, 1887�1890; was solicitor general of the United States, 1890�1892; was judge of the 6th Judicial Circuit Court, 1892�1900; was professor and dean of the law department, University of Cincinnati, 1896�1900; was president of the Philippine Commission, 1900�1901; became the first civil governor of the Philippine Islands, 1901�1904; declined an appointment to the Supreme Court; served as Secretary of War, 1 February 1904�30 June 1908; began American construction of the Panama Canal and served as conciliator in a threatened upheaval in Cuba; posed the possibility of probationary service for recruits before formal enlistment; directed an investigation into procurement procedures; approved the design of a new Medal of Honor; proposed disposal of small posts and concentration of the Army at brigade posts; was elected President of the United States and served from 1909 to 1913; was defeated by Woodrow Wilson in a reelection bid, 1912; was Kent professor of law at Yale University, 1913�1921; was chairman of the National War Labor Board, 1918; was appointed Chief Justice of the United States Supreme Court, 1921; retired from the bench on 3 February 1930 for reasons of health; died in Washington, D.C., on 8 March 1930. William Valentine Schevill (1864�1951) was born in Cincinnati, Ohio, studied at the School of Design there, and moved on to advanced training under Ludwig von Loeffts in Munich, Germany. He pursued his studies in London, England, and later painted on the Continent as well as in the United States. Schevill painted three portraits of Taft, who was Secretary of War, President of the United States, and Chief Justice of the Supreme Court. 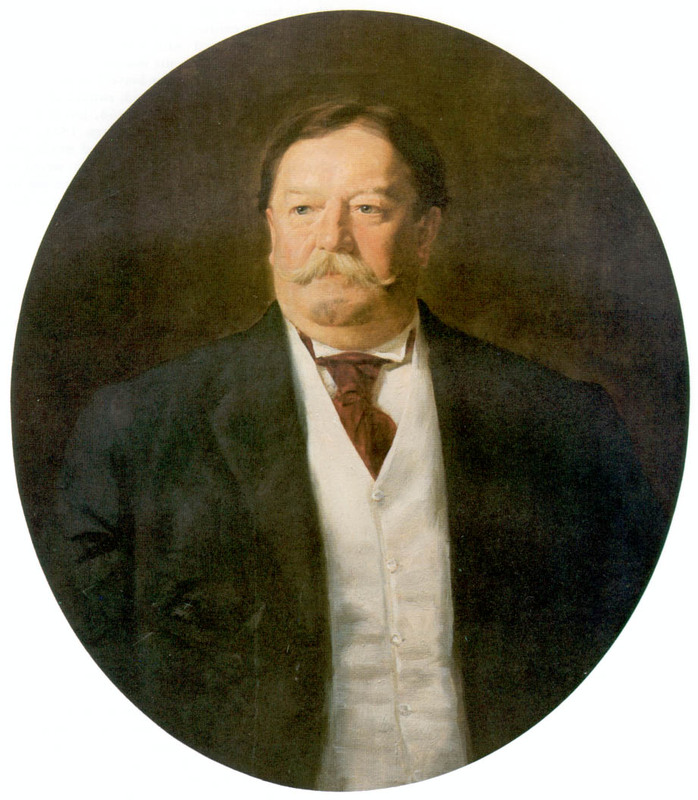 The secretarial portrait was painted in Taft�s first year as chief executive. Another Taft portrait by Schevill was presented to the National Portrait gallery by the artist�s son in 1972.